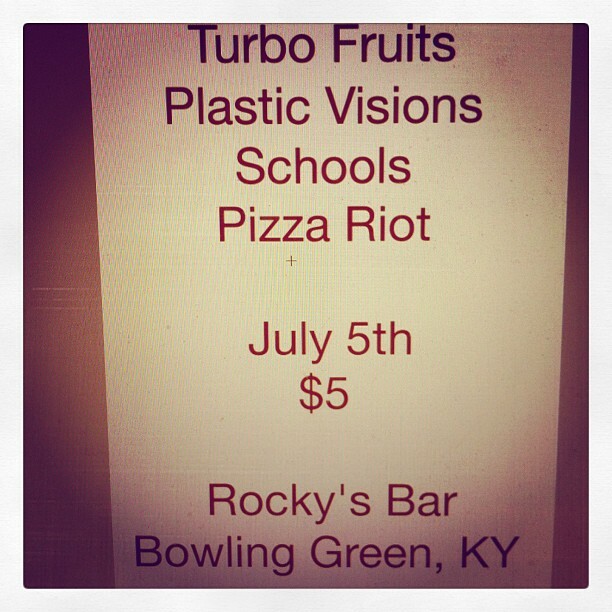 Concord America in Nashville | Plastic Visions in Bowling Green, KY | Friday July 5th | $5! We checked out Concord America, Schools, & Plastic Visions at Mercy Lounge a few weeks ago, and we dug that show so much that we thought you should know about Concord America’s show at Springwater this evening, and Plastic Visions’ show w/ Turbo Fruits, Schools, & Pizza Riot, also tonight, in Bowling Green, KY at Rocky’s Bar. Update: Plastic Visions will not be able to join tonight’s lineup at Rocky’s due to circumstances beyond their control. You’ve got some killer rock n’ roll options this Friday night for just $5, and we’ll break it down for you after the jump. Show option #1 is located here in good ol’ Nashville at Springwater, Ages 21+, $5 cover. Show starts at 10pm. Cute but absolutely ready to thrash, Concord America hails from Atlanta, GA, and blew us away when we saw them play Mercy Lounge. Check out their video for “Pity Party” below. They’ll have download cards for sale at the show, and we suggest you pick one up! Tennessee Scum brings their unique brand of garage/rock to the mix that makes you feel like partying and slapping someone at the same time. You can check out (and buy!) their latest release on Bandcamp. Rajhi Gahler is the new fuzz punk project of Micheal Jordan, Kyle Frary, & Ethan Rose, and they’re located right here in Murfreesboro. You can check out their 4-track album and buy it on their bandcamp here. Show option #2 is at Rocky’s Bar [308 W Main Ave, Bowling Green, KY, 42101], Ages 21+, $5 cover. Show starts at 10pm. We mentioned the rock n’ roll force of nature that is Plastic Visions in TWIN a few weeks ago, so if you didn’t catch that show, here’s your chance. If you’re too partied-out from the 4th to make a quick drive to Bowling Green, at least buy their EP on Bandcamp to complete your summer party soundtrack. We’ve got it on repeat. But we suggest you man up, grab five bucks & your buddies, and hit the road. Update: Unfortunately Plastic Visions will not be able to join tonight’s lineup at Rocky’s due to circumstances beyond their control. The Turbo Fruits are making a stop in Bowling Green on Friday before their appearance in Nashville at Summerdaze the the following day. Buy their shiz online here & check out a live vid of “Where The Stars Don’t Shine” below. Schools are a trio of rockers from Bowling Green, KY who recently recorded an EP with Grammy-winning producer Jay Joyce, right here at Tragedy Studios in Nashville. Check out their SXSW promo vid for “Alien” below. Which will you choose? Or do you have alternative plans? Tell us what shows we shouldn’t miss this weekend in the comments below. Lauren Strange hails from Memphis, and is a third-year Nashville resident. When she's not obsessing over rock n roll or Dave Grohl, she's probably petting her cat Rosie or adding to her David Bowie t-shirt collection. Her band is Lauren Strange & the Pretty Killers. Margo Price to Play Grimey’s Oct. 17 | Stream Her New LP ‘All American Made’ Early!